I was surprised when David Mackenzie’s Hell or High Water (2016) got an Oscar nomination for Best Picture (not that I ever give credence to the Oscars as indicative of anything other than the triumph of marketing). The film is so low key, with a deadpan sense of humour masked by a deep sense of melancholy, that it doesn’t seem to fit the Academy’s usual profile for what’s Big, Important and Crowd-pleasing. Mackenzie’s film, with a script by Taylor Sheridan, draws on that deeply-rooted American myth of the frontier, of the outlaw as righteous individualist, a line running from the western through the gangster narratives of the ’20s and ’30s (both of which faced revisionism in the ’60s and ’70s) – and finally embeds that narrative in the post-2008-crash era of economic loss and disillusionment. The outlaws here are two brothers from rural Texas, Toby (Chris Pine) and Tanner Howard (Ben Foster). They’re on a crime spree through small towns in their part of the country, taking small amounts of money in small-denomination, untraceable bills from various branches of the Texas Midland Bank. Toby is the impetus for the crimes, while Tanner, an ex-con, is the logistical planner. The core of the film is their relationship, a deeply held bond fraught with sibling competition, love and resentment. While Tanner was away in prison, Toby took care of their mother through a lingering cancer death. Now the bank is set to repossess the failing family ranch which had been unable to sustain the dual hits of the economic collapse and overwhelming medical costs. Toby wants to save it to pass on to his estranged wife as an inheritance for their son. This contest between a heartless bank and a struggling family raises echoes of the Great Depression, reflecting to the cyclical nature of the country’s history and pointing to the illusory nature of that American individualist myth. Scottish director Mackenzie, like other foreign filmmakers before him, brings a fresh eye to both the natural and social landscape of America. The film is rich in landscape imagery, beautifully shot by British cinematographer Giles Nuttgens, and just as sensitive to the characters’ emotional states. This tension between expansiveness and intimacy is what imbues the story with that air of melancholy; any attempt by these people to give themselves a larger self-image is constantly undercut by the reality they’re stuck in. This is as true of Marcus Hamilton (Jeff Bridges), the seemingly larger-than-life Texas Ranger on the brothers’ trail, as it is of the brothers themselves. Marcus works hard to create his image as a sly, sage, crusty old lawman – mostly through his bantering relationship with his Indian-Mexican deputy, Alberto Parker (Gil Birmingham). But Marcus too ends up losing a great deal in the pursuit. In the end, the cost of trying to embody the American Dream is very high and even when it seems to have been achieved, it remains only tenuously secure. The VVS Films duel-format release includes several interview-based featurettes about the making of the film, plus a post-screening Q&A with the actors and director. Ti West’s latest movie also draws on the western myth of character defined by a landscape beyond the constraints of civilization. The setting of In a Valley of Violence (2016) is a small unfinished town erected in a barren wasteland at the edge of a desert. This town by its external form is a signifier of order, of civilization; but that order is an illusion. It is run by a Marshal (John Travolta), not through any formal rule of law, but rather by his violent force of will. His power gives license for his son Gilly (James Ransone) to run wild, to bully and lord it over his gang of layabouts and his girl Ellen (Karen Gillan). Into this town, wandering from the desert, comes a stranger named Paul (Ethan Hawke). 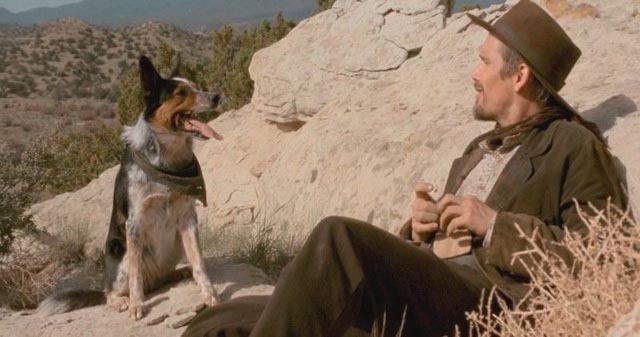 Haunted by his past – the violence of the Indian Wars, his abandonment of his military post and his family – Paul has no desire for human company; he invests instead in his relationship with a dog (which gives one of the great animal performances). Inevitably, Paul runs afoul of Gilly and his gang. The Marshal, knowing his son’s hotheadedness, steps in to defuse the situation, but he has little real control over Gilly and the gang go after Paul when he leaves town. And make the classic mistake of not making sure that he’s dead. The film draws on many familiar western tropes, both of the classic and the spaghetti variety. This is indicative of both West’s strengths and his weaknesses; he has a fine-tuned sense of the various genres within which he works, but often can’t seem to transcend a knowing reiteration to create a fully realized work capable of standing on its own. His best works, Trigger Man (2007) and The Sacrament (2013), do achieve this kind of creative wholeness, while others (The House of the Devil  and The Innkeepers ) leave a vague feeling that they could have been much more satisfying than they ultimately are. In a Valley of Violence, thanks to the strong performances and its rich sense of place, leans more towards the former, although in the end it does seem more like an essay on the western than a true expression of the western myth itself. That said, it is one of his most engaging and entertaining movies. The Universal Blu-ray is essentially bare-bones, the only extra being a 2-minute promo clip. Film critic and historian Mark Cousins, best-known for his idiosyncratic documentary epic The Story of Film: An Odyssey (2011), offers a very different essay on the relationship between place and character in I Am Belfast (2015). Like its predecessor, this extremely personal film is quirky, argumentative, illuminating, and at times irritating and obscure. 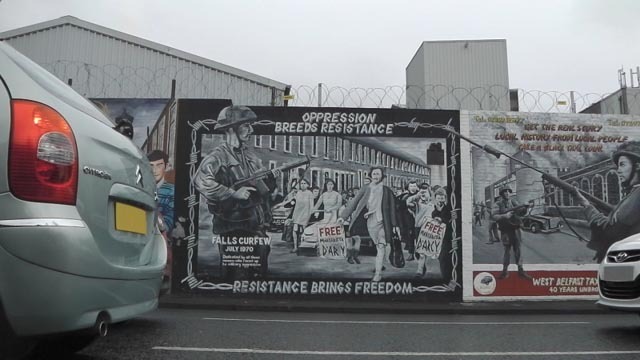 Having been born in Belfast, the city has remained a part of his emotional and psychological make-up, even though he moved away years ago. Having made documentaries about subjects in far-flung locations (Iran, Albania, Sardinia), Cousins finally circled back to his own roots with this subjective, poetic, pretentious and moving film. Using the actress Helena Bereen as an embodiment of the city’s history and spirit, Cousins digs into the currents of religious conflict, of prejudice and violence and resilience which have shaped Belfast over the centuries, and from which it has tentatively emerged in the past couple of decades with the uneasy end of the virtual civil war between Protestant and Catholic and the colonial war between Irish and English. The film is full of striking imagery which finds startling flashes of beauty in the urban landscape, and at times strives for potent metaphorical effects, which occasionally seem more trite than profound. But there is an overriding sense of allusive mystery which holds the viewer’s attention and suggests that the film may repay repeat viewings for further insights into this deeply conflicted city. The BFI dual-format release includes five interview-based featurettes totaling 67 minutes, with Cousins, Bereen and cinematographer Chris Doyle talking about the making and meaning of the film. Deadpan is an inadequate description of the most singular and idiosyncratic film by Andrew Bujalski, one of the “inventors” of Mumblecore (a lo-fi, improvisatory style of filmmaking characterized by largely non-professional casts, an absence of plot, and an emphasis on characters and relationships). Computer Chess (2013) is a work of what might be termed “retro futurism”. 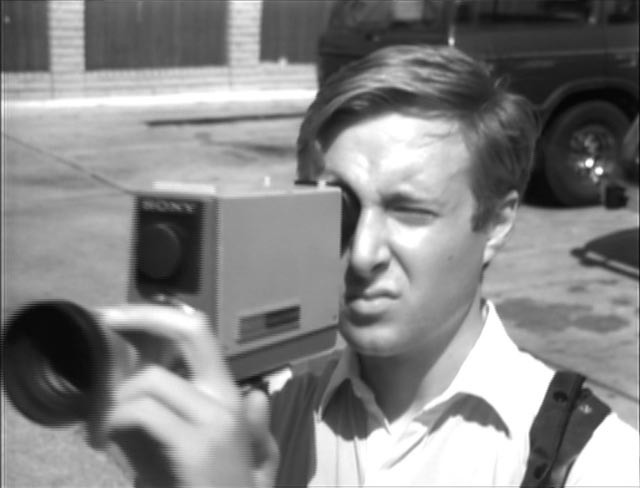 Set in 1980, it was shot on old Sony analog video cameras, providing an aggressively low-res, grainy black-and-white image (except for a single sequence in colour) rife with artifacts like flares and streaks resulting from the camera tubes’ inability to handle high contrast lighting. 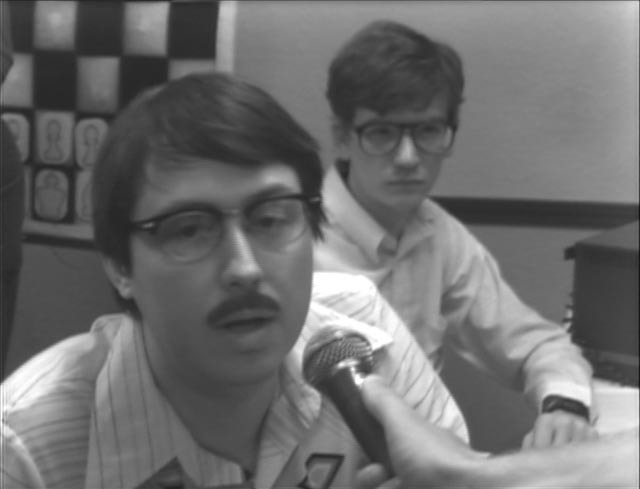 The film purports to document a weekend-long competition at a nondescript suburban motel during which various teams – from well-funded universities and barely-funded basement workshops – pit their computers against one another in a chess tournament. Here at the dawn of the personal computer age, a bunch of geeks are trying to establish whether their machines are capable of the kinds of adaptation and innovation which suggest a nascent machine intelligence. Much of the film’s humour comes from the contrast between these ambitions and the social awkwardness of the participants. The efforts to create artificial intelligence come to seem like desperate attempts to overcome the inventors’ own limitations and inadequacies. The film divides its time between the sometimes tense chess games (overseen by a grandmaster who circulates and comments on the action for the camera), late night discussions of the nature of reality and of intelligence itself, and a parallel event at the motel which occasionally intersects and impinges on the activities of the geeks: a kind of “human potential” workshop in which a group of middle-class seekers undergo a series of games and activities intended to release their inner selves. This culminates in a supremely awkward scene in which a swinging married couple try to draw one of the terrified geeks into a three-way session in their room. Computer Chess, apart from its intrinsic charm as a glimpse of an era which now seems lost in a distant past (only three decades ago! ), induces a mixture of nostalgia and reflection on what has since grown out of these awkward beginnings – the wired world we now live in, where our interdependence with multiple devices and a vast social space which is increasingly disconnected from the physical environment our bodies inhabit has troubling implications for our own sense of identity and our relationships with others. While on its surface, the film seems almost tossed-off, artless, a casual artifact, beneath that surface is a carefully considered examination of the current state of human intelligence and its relationship to our alternative manufactured environment. The Masters of Cinema dual-format edition includes the special features from a previous Region 1 Kino Lorber DVD release and adds some substantial additional ones. There are two commentary tracks plus numerous featurettes and interviews which illuminate Bujalski’s creative intentions. I recently got to see Ken Russell’s debut feature, French Dressing (1964), for the first time, courtesy of Network’s 2015 DVD. It’s not surprising that Russell should have taken on a commercial project to break out of television, where he had enjoyed occasionally controversial success with his unconventional “documentaries” about artists, composers and writers. But the results here, as in his next feature, Billion Dollar Brain (1967), show an artist not entirely comfortable with his material. Slapstick seaside comedies had been a staple of British cinema for decades, offering an opportunity to poke holes in propriety with characters temporarily separated from the normal routines of their lives. But Russell had a temperamental aversion to easy conventions, giving French Dressing’s satirical treatment of the Carry On elements a darker edge. It’s not entirely surprising that the film wasn’t a commercial or critical success: on its surface it looks as if it should be light comedy fluff, but it has an undeniable undertow of sadness, as if a deep English inertia dooms the protagonist’s schemes to failure from the start. Jim Stephens (James Booth) is an opportunist continuously on the make, with regard both to women and to making money. Although involved with Judy (Alita Naughton), he always seems to be looking past her for a better opportunity. And his job renting deckchairs on the waterfront is way beneath his ambitions. When he gets the idea to raise the bleak little town’s profile by setting up a local film festival (look what that did for Cannes! ), he manipulates the Mayor (Bryan Pringle) and council to go along with the plan. All he needs to do is persuade a French starlet (Marisa Mell) to be the guest of honour. She doesn’t take much persuading, as she’s fed up with the Continental softcore her boyfriend/manager keeps putting her in. Russell has some fun with the lengths to which the upright citizens of the town will go to get a little of the glamour the starlet can impart to their dreary lives, but the script (by Peter Brett, Ronald Cass and Peter Myers, with touch-ups by Johnny Speight) doesn’t give the director enough material to support his obvious desire to satirize not only the poky limitations of provincial English life but also the commercial and artistic pretensions which attend film festivals. The film is never as funny or clever as it could be and perhaps thinks it is. And yet Russell rises to the demands of the bigger canvas by creating wonderful widescreen compositions (shot by Kenneth Higgins, who would go on to shoot Darling for John Schlesinger and Georgy Girl for Silvio Narizzano) which discover a kind of natural surrealism in the ordinariness of the setting. His visual compositions and staging constantly reveal a genuine affection for silent comedy, while the editing echoes the characteristic freedom of the French New Wave. And although Booth is a bit grating in the lead, Russell choreographs his cast with energy. Despite a mismatch between the raucous content and the elegance of the execution, there’s an undeniable air of confidence in Russell’s direction and the film plays like an early sketch or trial run for his glorious musical extravaganza The Boy Friend (1971), which far more successfully blends seediness with elegance. Speaking of trial runs: Roy Kinnear as Booth’s sidekick here plays almost exactly the same character as his cruise social director in Richard Lester’s Juggernaut (1974). This entry was posted in Commentary, Review and tagged Actors, Blu-Ray, British Film, Comedy, Directors, Documentary, Satire, Violence, Western. Bookmark the permalink.